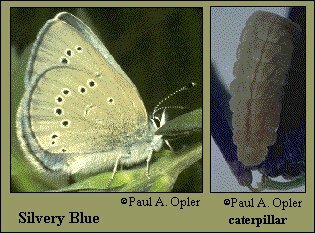 Identification: Upperside of male iridescent silvery blue with narrow dark borders; female darker blue with wide borders. Both sexes have white fringe. Underside gray-brown; both wings with row of white-ringed, round black spots. Subspecies xerces (Doubleday) and pseudoxerces Emmel and Emmel have large white spots with or without black centers. Life history: Males patrol near the host plants for females. Eggs are laid singly on flower buds and young leaves of the host plants. Caterpillars feed on flowers, seedpods, and young leaves and are tended by ants. Chrysalids hibernate. Flight: One flight from March-June at low elevations, June-August at high elevations. Caterpillar hosts: Astragalus, Lotus, Lupinus, Melilotus, Oxytropis, Lathyrus, Vicia, and other species in the pea family. Adult food: Nectar from flowers including Asteraceae. Habitat: A variety of locations including open woods, coastal dunes, prairies, meadows, road edges, rocky moist woods, and brushy fields. Range: Central Alaska south to southern California, Baja California, Arizona, New Mexico, and western Kansas. Along northern United States east to Nova Scotia and south to Georgia. Conservation: Subspecies palosverdesensis is thought to be extinct. Its historic range and its hostplant Astragalus leucopsis in the Palos Verdes Hills in Los Angeles County, California is largely extirpated, but an additional population was discovered in nearby San Pedro. This subspecies has The Nature Conservancy rank of T1 - Critically imperiled globally because of extreme rarity (5 or fewer occurrences, or very few remaining individuals), or because of some factor of its biology making it especially vulnerable to extinction. (Critically endangered throughout its range). Subspecies xerces is TX - Presumed extinct. Subspecies pseudoxerces is rank T2. Management needs: Conserve all remaining habitat for the Palos Verdes Blue. Investigate status and conservation needs of subspecies pseudoxerces. International Union for Conservation of Nature and Natural Resources.